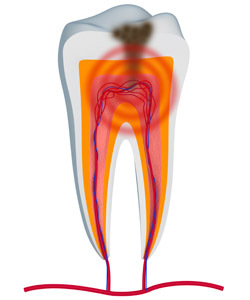 These are signs that the nerve and/or pulp inside the tooth has become infected or damaged by decay. Painful toothaches should never be ignored because untreated tooth decay can spread to neighboring teeth or lead to other serious medical complications. How Does Dr. Taylor’s Modern Dental Technology Alleviate Root Canal Pain? For most people, the tooth pain they are experiencing prior to making an appointment is more uncomfortable than the procedure itself. The modern dental technology used by our office allows the dentist to carefully remove infected or decayed pulp from the tooth while leaving them as much of the external structure intact as possible. The purpose of the nerve in the tooth is to detect and differentiate between hot and cold; removing it will not affect chewing and probably won’t even be noticeable. The inside of the tooth is then carefully cleaned, filled, and sealed to prevent bacteria from re-entering. Keeping the natural tooth intact in the gum greatly reduces pain and recovery time for the patient. What is the Recovery Time For a Root Canal? After your root canal procedure, the tissues around the treated tooth may stay irritated and inflamed for a few days after the procedure. This is normal. Ideally, the pain should subside after about two weeks. If the pain still continues after this period, you should schedule a follow-up appointment with Dr. Taylor in Rock Springs. Typically, research has shown that all pain and inflammation should reside after about 1.5 to 2 weeks. After the tooth has been cleaned and filled, Dr. Taylor may choose to reinforce the damaged tooth with a porcelain crown to ensure full strength and functionality for the years to come. Using our computer-assisted dental technology called CEREC, we are able to custom-manufacture an attractive crown that looks and performs like a natural tooth. Our office takes pride in relieving discomfort and keeping your smile natural and healthy. If you are experiencing severe tooth pain or have any questions, please give our Rock Springs office a call today.